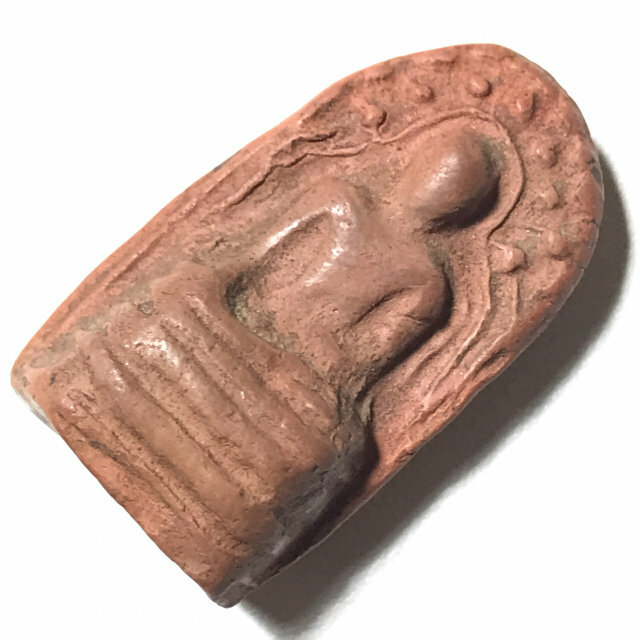 A rare early era amulet of the great Sak Yant Master, Luang Por Guay, of Wat Kositaram in Chainat Made from Wan Sabu Luead Muan Sarn Sacred Powders and Baked Earthen Clay, made with the hand pressing method used to create Benjapakee Clay amulets according to the Dtamra.The Pra Pim Pra Kong Luang Por Guay is a highly preferred Pim (Pim Niyom) of the pantheon of amulets of Luang Por Guay. This particular exhibit is a Thaan Kiang (breadboard dais), without lotus petals, notable for its pristine condition and clear features, and its immense aesthetic beauty. A rare chance for a rare amulet for true Devotees of Luang Por Guay, for Bucha, and blessings of Maha Lap, Metta Mahaniyom, Maha Pokasap, and Serm Duang. Luang Por Guay is famous for his immensely diligent and complex manner of empowering (Pluk Sek) amulets, which involved daily empowerments at various times of day namely at dawn, morning, midday, afternoon, evening and midnight. In addition, he would perform empowerments during the various 'Reuks' (Astrological Influential moments), to bring total coverage of protection and fortuitous blessings to all who might wear and Bucha his amulets. This ritual involved the Adept knowledge of the 'Reuks Mongkol' Buddhist Auspicious alignments, the 'Reuks Jone' (Gangster Alignments), Inauspicious Alignments, and the 'Reuks Bun Paya Marn' Demonic Influential Alignments. This means that it did not matter who wore his amulets, Good people would wear them, Gangsters would wear them, anybody could wear them without loss of magical effect. Luang Por Guay was born on 2nd of November 2448 in the year of the snake. Luang Por Guay was already was already able to read the Dhammapada and Pali Prayers long before he ordained at the age of seven, having learned from Luang Por Khuad. Luang Por Guay was Ordained on the 5th of June 2467 at 15:17 pm. He was aged 20 years old. Luang Por Guay was famous for his Mastery of many different Wicha, including the Wicha of Tattooing Sak Yant. Every single edition of amulets he ever made are now rare classics and highly revered for their Magical Power. On the 1st September 2491, Luang Por Guay was elected Abbot of Wat Ban Kae. Luang Por Guay saw that the folk of Ban Kae were very poor and many people did not have enough to eat, and thus took up the practice of only eating one meal a day instead of the two before midday which are normally allowed for a Maha Nikaya Buddhist monk, in support of the people and to consume less. He would help the poor and needy and heal the sick, give Buddha amulets to those who needed some confidence and something to help them fight on in life, and try his best to improve the life of local Folk in general. He was very loved for this by the local Folk. Luang Por was not a monk who liked to build things or develop, he liked simplicity and stillness. Even his Kuti was old ‘Song Thai’ (Thai style wooden house), that he had given the temple lay committee and some Looksit the task of building it to save money, and only hired special craftsmen for the most difficult pieces of the building.